Recently built cottage in the heart of the Creuse countryside, inside the regional park of Millevaches in a hamlet where you will find peace, relaxation, rest. 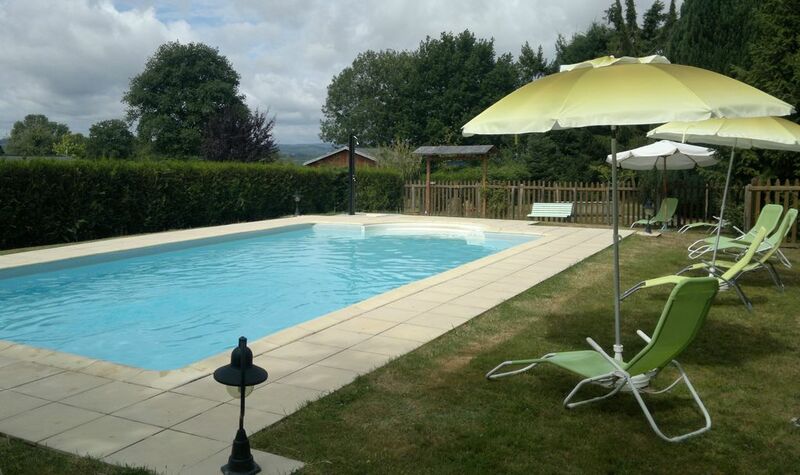 hiking, fishing, swimming (Vassivière lake) At your disposal swimming pool 10 m by 5.50 m, heated with a heat pump. It is equipped with a swim against the current as well as a spa stairs with air and water nozzles. The water treatment is carried out without chlorine for comfort. Great scenics with nice roads. We definitely come back with our bikes next time. The swimming pool and the veranda were the great plusses. The Internet could've been a bit better. Otherwise it's exactly as one should expect. Nous avons passé un excellent séjour. Le terrain est magnifique, beaucoup d'espace pour nous et notre chien. Arboré et clos, c'était parfait ! La piscine est très bien également, le contre courant est vraiment chouette. Voor ons ideale vakantieplaats. Prachtige chalet met nodige voorzieningen en een leuk zwembad. Echte nostalgie. Ook een beetje back to basic, ideaal voor ons. Heel vriendelijke eigenaar. De kinderen hebben ongelooflijk genoten van het zwembad en de heel ruime plaats voor de chalet. Propriété très sympa et très calme. Parc clôturé très apprécié pour notre chien. Petits lapins accueillants le matin à notre réveil. Recommandation pour cet endroit.